Last week I introduced you to Strasbourg, one of my favorite cities in France. In case I’ve tempted you to visit, I wanted to pass along my “unscripted” food discoveries (I will discuss wine next week). If you happen to go to any of the places mentioned…please say hello for me and let them know I sent you :-). Traditional Alsatian fare is simple, honest, soul lifting comfort food that’s great on a cold winter day. Two signature dishes are tarte flambée and choucroute garnie. 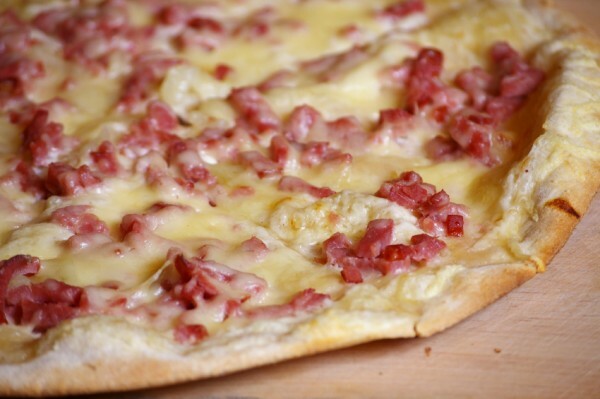 Tarte flambée (pictured above) is a thin flat bread that is (usually) topped with cheese, onions, and Alsatian bacon. The cheese, which is either fromage blanc, crème fraîche or a mixture of the two, serves as the perfect accompaniment to the toppings: tangy, complex, rich and flavorful without feeling heavy. The Alsatian word for tarte flambée is flammekueche. Combining the words ‘flame’ and ‘cake’ it’s a word that evokes images of flames dancing inside a wood-fired oven as the dish is quickly cooked to perfection: crisp and slightly charred on the outside, warm and soft on the inside with the onions cooked to soft sweetness. Although you can find tarte flambée all over Strasbourg, please consider holding out for perfection and finding a place that uses a wood-fired stove. Recommended to me by our dear Alsatian friend Denise, au Joyeux Pêcheur is a restaurant on the outskirts of Strasbourg that you can easily get to by bus. Not only do they have wonderful tarte flambée but their fish is also very good. 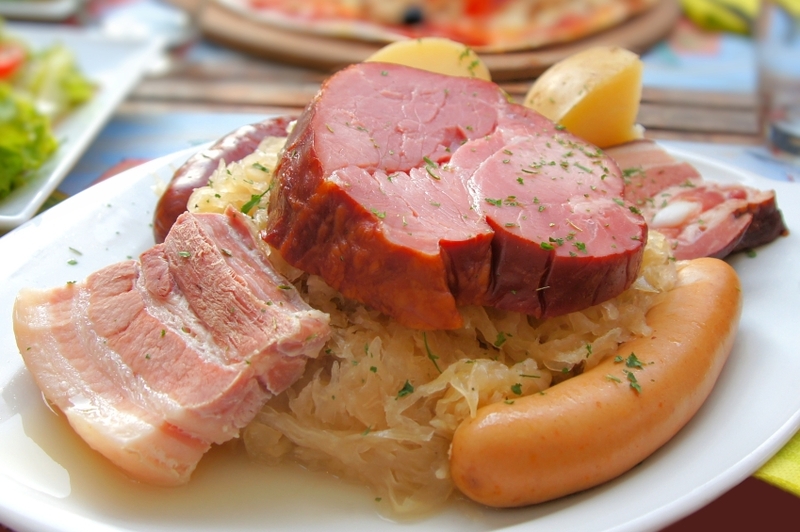 and is garnished with cuts of pork, charcuterie, and potatoes to form the Alsatian dish known as choucroute garnie. Traditionally eaten during the winter after the cabbage has fermented to a light tartness, choucroute garnie is a formidable and filling dish that demands attention and a nice bottle of Alsatian wine. It’s also a dish that elicits strong opinions. Consequently, so I don’t accidentally step into a debate my stomach cannot handle, rather than choose my favorite place to find choucroute garnie, I’ll recommend my preferred place to buy meat: Porcus. There are many great butchers in Alsace but Porcus does more than sell meat and side dishes to take home: They also have a really good restaurant I highly recommend. 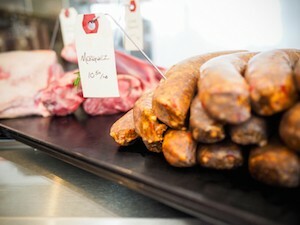 Try their knack, a sausage that gets its name from the German word knacken, which alludes to the sound made when you bite into it. Knackelicious! Looking for a great place to have an unhurried lunch or perhaps a really nice salad? One of my favorite French restaurants in Strasbourg is La Petite Mairie near Place Broglie. The food is great and the owner is charming. They get quite busy though so please be sure to make a reservation at least a couple days in advance. I’m a big fan of Lebanese food and wines so when I travel and have an opportunity to eat at a Lebanese restaurant that serves both, I make it point to stop in. Au Cèdre fits that bill perfectly with delicious food and a nice outdoor seating area. On a warm summer day it’s a perfect place to sip a Lebanese rosé and taste some lighter fare. If you’re traveling with kids, pizza makes them happy and happy kids make you happy. If that’s the case, give Moustique & Frelon a try. Located near the Les Halles shopping center it is a great place to take a break from all the wonderful Alsatian food. Alternatively, consider leaving your kids at Les Halles (there is a McDonalds inside) while you enjoy a long lunch under the trees with a bottle of Italian wine and your honey. The merguez is a thing of beauty which you must try. A spicy sausage that originates from northern Africa and has become very popular in France, it is made from either lamb or beef. It’s red color comes from a Tunisian chili paste known as Harissa and it works perfectly inside a baguette with toppings and a side of fries. I remember the first moment I bit into one of these sandwiches well. It was during a World Cup game at the Centre Social et Culturel de l’Elsau on the outskirts of Strasbourg. While my son (who was five at the time) was playing soccer in the streets, I was watching Les Bleus beat Switzerland 5 to 2 inside a packed auditorium. Presented to me in a foil wrapper, because the auditorium was only lit by the game, I didn’t know exactly what I was eating but after my first bite I was hooked. The spicy taste explosion of merguez was tempered by a wonderful sauce made of ingredients that I wasn’t able to discern (it was dark after all). The veggies served to balance the texture and depth of the dish by adding crispness to the bite and freshness to the taste. And let’s not forget about the baguette…it served as the perfect foil to the entire assemblage and ensured that not a single ingredient was dropped between goals. Fantastique! You’ll have no problem finding a place to sample a merguez sandwich while in Strasbourg and I do hope you’ll consider trying one. In case you find yourself close to Strasbourg’s central square I’d recommend visiting Restaurant Halic, a small restaurant across the street from the Ill River. Open until (I believe) 12:30 AM it’s a great place to take a break and get a bite to eat. My favorite espresso is at Cafe Le Rendez-Vous. If you’re there in the morning you can also get some bites to go along with it. Prefer your coffee with milk or cream? Before ordering café au lait or café crème please give café noisette a try. It’s a shot of espresso with some some foamed and unfoamed milk (some cafes will bring you a pitcher so you can make it up yourself) and I believe will serve as a better approximation to what you’re looking for. Although there are many tobacco shops all over Strasbourg, in case you enjoy cigars (or pipe tobacco) I’d recommend Le Comptoir du Cigare. They have a nice collection in their humidor, including cigars from Quai D’Orsay, and are staffed with friendly folks who are knowledgeable and passionate about what they sell. Below please find a list of addresses and phone numbers for the places mentioned. The phone numbers assume you’re calling from a mobile phone. If you’re calling from a French landline drop the +33 and put a zero in front of the first number you see. I don’t know about you but I’m getting a little hungry.